Battlesteads Hotel and Restaurant in Wark, near Hexham, has added to its growing awards collection by scooping the Considerate Special Commendation Award at the 2015 Considerate Hotel of the Year Awards for their continuing efforts to develop a sustainable, successful business. Announced at a gala lunch at the Mandarin Oriental Hyde Park in London on Friday 3 July, the awards, held by Considerate Hoteliers, celebrate the hotels around the world leading in environmental, sustainable and socially responsible practice. This is the third time that Battlesteads has picked up a Considerate Hotel Award – owner Richard Slade received the ‘Good Egg’ award for his relentless hard work and innovative approach to eco-tourism in 2013, and the hotel was also crowned Considerate Hotelier of the Year in 2011. The award was presented to owners Richard and Dee Slade by John Firrell, Chairman of Considerate Hoteliers, who said: “I have been fortunate to have witnessed Battlesteads emergence as trailblazer and mould breaker over the years, and they represent the perfect example of what a Considerate Hotel should be - welcoming, friendly and inviting with a responsible consideration for taking care of the planet and its precious finite resources and a social responsibility towards guests, staff and the local community. 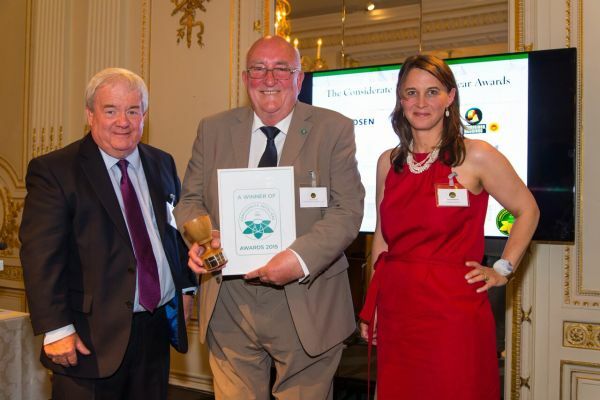 The award adds to the catalogue of accolades Battlesteads has received to support their green credentials, having previously achieved a Platinum level rating in TripAdvisor’s GreenLeaders Programme in 2014, won Green Hotel of the Year at the Hotel Cateys in 2011 and a Gold Star Award at the 2011 Green Tourism Awards. The hotel and restaurant also has Three Star Sustainability Champion status, awarded by the Sustainable Restaurant Association (SRA). For more information on Battlesteads Hotel and Restaurant and to book one of the new luxury eco-lodges visit www.battlesteads.com.